our front porch and collected some Images. First, I wanted to make sure that one of the three stars I could just barely make out was indeed the North Star. To find out for sure, I did several 3 minute exposures of the suspend stars to find which one was really the North Star. The first two guesses were rejected because the long 3 minute exposure showed the earth's relative motion showed up as star trail streaks. The final photo image I collected indeed captured the North Star because the longer exposure showed very little effects for earth rotation because the visible stars are so close to the North Pole. 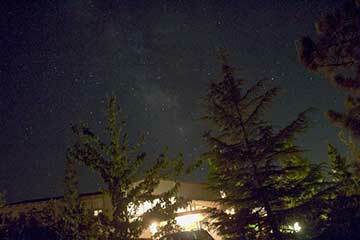 The third photo shows an enlarged blow up showing the closest star next to Polaris. Is this star the real companion of Polaris? I'm still not sure and pose the following homework questions to work on for next time. Q1. What is the angular distance between these two stars? When I looked at the magnified pixel view of this third photo, I found the distance was about 20 pixels, which represents about 1 arc minute with my 300 mm telephoto lens. Is this the distance to Polaris' companion? My previous estimate based on a guess of the right ascension and declination was that it should be only 14 arc seconds. Maybe instead of just guessing, we should doe the real calculation to transform the difference in right ascension and declination back to real angular distances to be seen with a camera image taken from Mission Viejo. This is all spherical trigonometry and I have some pre-canned software that can be used to perform this transformation. This is my next homework calculation. Q2. Is the orientation of the supposed companion at the correct orientation for where the companion would be. The photo image was collected last night at about 10:00 pm. This analysis calls for a calculation that indicates the predicted positions based on the star catalogs listing of the right ascension and declination and be calculated. This is left for homework.